Girl ExtraOrdinare was created by Tiffany Bressan and Courtney Noelle, two friends from college with one dream. Their message is to stay inspired, and be creative! Girl ExtraOrdinare sells designer apparel and accessories, custom made to fit your style. 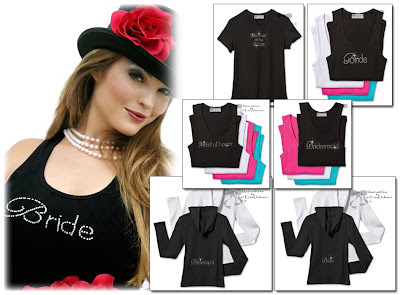 Their company is perfect for bridal showers and wedding apparel. Whether your the bride, or the bridesmaid, Girl ExtraOrdinare can customize and add as much bling as you want to your outfit! I know I know, it's what you've all been waiting for.. ok so one lucky beauty is going to win their choice of the below tops. Please note these are small sized. Your gonna have your choice of the I love Makeup Top, Ice Cream top, Makeup Rocks, Or Cupcake Top. They are beautiful and blinged out! The picture doesn't do it justice! So here's what you have to do.. visit Girl ExtraOrdinare, tell me where your closest retail store, OR what fabulous item you would love to have, and how you customize it! This is Mandatory if you want to enter. So good luck! Giveaway will end -9/16. Winner will chosen by random.org No Po Boxes Please! Winner will have 48 hours to respond to the winning email or another winner will be chosen. I am a fan of Bella's Beauty Spot and Girl ExtraOrdinaire on Facebook. I shared with over 200 friends on Facebook. I've visited Girl ExtraOrdinaire. I would love to have Baby tanktop that has my name on it with a bling. I would love the a "Birthday Girl" tank top! I am going to Disney World for Thanksgiving and my birthday will be when I am there! I will definitely keep Girl ExtraOrdinaire in mind for my best friends Bachelorette party! Also, tweeted about this giveaway! I really liked the canvas totebags and the pet's wall art! There are no stores in my state, but, from their site I love the Birthday Girl tee. i like the pink hoodie with the wors "because I am" on it. #1 I Like Girl ExtraOrdinare on their Facebook page, and told them Bella's Beauty Spot sent me. #2 I Like Girl ExtraOrdinare on their Facebook page, and told them Bella's Beauty Spot sent me. #1 I follow you via Google friend Connect as nightowl. #2 I follow you via Google friend Connect as nightowl. I "Like" you on Facebook.. There are no stores in PA but there are LOTS of online retailer choices! The closest retailer to me is My Wedding Favors in Birmingham, AL. The closest fashion store to me is Carlton House. There are no stores in minnesota. 1- I like girls on facebook. And i posted you sent me. 2- i like girls on facebook and posted you sent me. No store nearby. I like the dog pet collection, so cute! I can find Girl ExtraOrdinaire at Saint Louis Wedding Consultate about 5 minutes from here! There are four locations near me. The closest is called The Bridal Party and is 25 min away. I couldnt find a retailer close to me but my favorite item would be the tank top from the Mommy and Baby section. I would like it Personalized with my (daughter's name)Mommy. My nearest retailer is Tux of Class, right in Antioch, CA 94509 where I live. I dont have a retailer close to me however i like the mom and baby collection that says Danielle and Danielle's Mommy. Liked Girl Extraordinaire and left comment stating bella's beauty spot sent me. Wow, there is a store about 10-15 mins from my work! Red Marq is my closest retail store and it's down the street from my job!! Bella Gowns in Redmond WA is the closest retailer to me. I would get the Bride tee..
2.I "Like" you on Facebook.